I started feeding the crows on Saturdays, several years ago in order to “strengthen” Saturn’s function in my life. Saturn’s function in our lives is to help us to develop long-term stability and focus, to persevere in the face of delays and obstacles, and to endure the kind of pain that is beyond our ability to control. When Saturn is strong, we can work for long periods of time in isolation in order to complete something of long-term value, and we’re willing to do all the boring, tedious stuff involved in any successful project. When the first Vedic astrologer I ever went to recommended that I feed the crows to help Saturn take care of Saturn’s significations in my life, I thought he was kidding. But no, he said feeding birds, different foods on different days of the week, support the planets as each day of the week corresponds to one of the traditional seven planets, and as you’ve figured out, Saturday is ruled by Saturn. I was intrigued by this unusual idea, so I started to feed the crows on Saturdays. The concept is that when the crows seem to trust you (they’re too smart to trust humans easily), then you’ll know you’ve gained the favor of Saturn. Feeding the crows is also a way of developing a relationship with the planet Saturn and what Saturn represents, thereby strengthening the Saturn function within your psyche. Being someone who starts (too many) projects with enthusiasm, but often doesn’t continue with a project after enthusiasm has waned, this seemed like a fun way to develop more discipline and focus. For a couple of years my husband and I fed the crows on the front lawn of the house we were living in at the time. After a month, we noticed that the crows were lined up sitting on the telephone wires waiting for us to throw the torn-up bread heels on the lawn for them. The amazing thing was, they didn’t line up and wait for us every day, but only on Saturdays! At first, we just threw out plain bread heels and sometimes other leftovers, but we were so delighted that they were smart enough to know when it was Saturday, that we started to spoil them a little. We added peanut butter, honey, and sunflowers seeds to the bread heels. My husband figured out that they didn’t like the typical birdseed used to feed birds because the seeds were too small for their larger beaks. We also discovered that they love dried cat food (dried dog food pieces are too large for them to eat easily). After a time of feeding and watching them, we noticed their individual personalities and how they looked at different life stages; the adolescents are shinier and sleeker, and smaller, of course, than the adults. We have never seen any of their babies, nor did we go looking for their nests because we didn’t want to threaten the bond we seemed to be developing with them. Two years later, we had to move. We only moved down the street and around the corner to an apartment building, but we stopped feeding them because several children play on the lawn inside the apartment complex and we never saw the crows walking around, or foraging on the lawn. I felt bad though, especially when they seemed to follow my car everywhere I went. 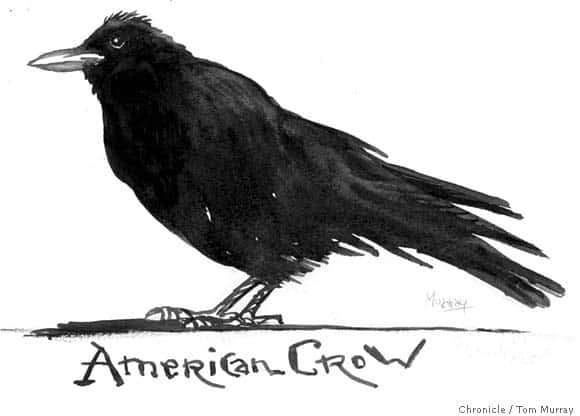 For a while, every time I got in or out of my car, whether I was at the local grocery store, or 23 miles away in the parking lot of the company I worked at, the crows were right there cawing and squawking at me like they were giving me a good scolding. I thought it could have been my imagination, but they stopped following and scolding me after about two months. I definitely noticed and was relieved when they stopped, but I continued to feel bad about it. This all happened about eight years ago, and about eight months ago we decided to see if they if they would come down to the lawn area and eat if we left food out for them. It took about four months, but we started to see them cautiously (caution is a Saturn quality) hopping on the grass, inspecting, and then eating the food we left out for them. It’s such a simple thing, requiring nothing more from us than putting out food out for them every Saturday morning (actually just after midnight on Friday night), but when we saw them once again eating the food, we were as delighted and excited as if we had spotted unicorns. Recently, I was sitting in my home office, and I noticed a crow kept flying really close to the window, squawking his head off. There are no window sills he could alight on, so he just kept flying by as close as he could. I realized that we had forgotten to leave food out for them the night before as usual (there had been some recent changes to our schedules that threw everything off). The crows know who is feeding them, what apartment we live in even though it’s always dark when we leave out the food and the grassy area is surrounded on three sides by several apartments. Even more amazing, is that they know what room I work in! Mind you, my office is in the back of the apartment. These are intelligent birds, did I mention that? Believe it or not, someone spent 10 years studying crows, created a vending machine that the crows operate, and did a TED talk about them! Ashtakavarga, the Vedic transit technique, can also reveal in what sign or signs Saturn is not naturally supportive of you. When Saturn is transiting those signs, Saturn remedies are helpful, and feeding the crows is one of the more rewarding! The Whole Life Consultation. If you would like remedies for your planets, including gemstone recommendations for your health, get the Whole Life consultation. My recommendations are the Vedic remedies of mantras, gemstones, and feeding the crows, but I also suggest books, coaches, therapists, courses, writing and other activities including how to use the Planetary Hours to intensify the remedy. The Whole Life consultation is still on special at 20% OFF making it $185 normally priced at $231. It’s 90 minutes long and you get a recording. We cover career/purpose, relationship, health, spiritual path, timing and you get a free Horary question with it too.